Okinawan indies band Mongol800 is the force behind the “What a Wonderful World” outdoor music festival in Yomitan this weekend. A combination of Okinawa and mainland Japan’s top musicians are descending on Yomitan this weekend to stage a two-day open-air music festival being tagged “What a Wonderful World!! 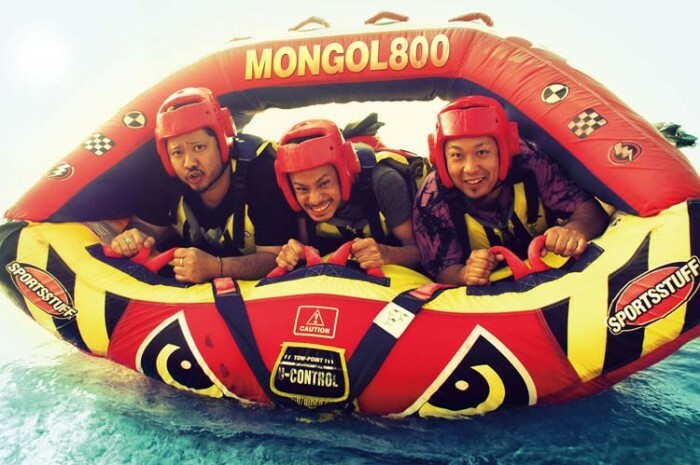 First held in 2009 by Okinawan local charisma rock group Mongol800, the bi-annual festival has developed a cult following as well as a desire by big name musical groups to participate. Canceled last year by a typhoon, the festival this year is hoping an approaching typhoon will veer off one way or another to allow the event to go on at the Yomitan Resort Okinawa in Yomitan Village. The music fest is a mixed bag, with music of many genre, including punk, reggae, hip hop and rock, performed by more than a dozen of Okinawan and Japanese singers and groups, including Mongol800, Begin, Yuzo Kayama, who plays as a part of King ALL STARS and Kazumasa Oda. Gates open both days at 11 a.m., with live entertainment running from 1 p.m. to 10 p.m. A one-day ticket is ¥7,800 in advance or ¥8,300 at the gate. A two-day advance ticket is ¥15,000. Free parking is available for cars entering from the Iramina intersection of Highway 58. A pay service shuttle bus will operate 9 a.m. ~ midnight at a cost of ¥500 for a one-way trip or ¥1,000 for a round trip. Organizers say the music festival concerts will go on even if it rains, but will be canceled in the event of rough weather. On stage Saturday are MONGOL800, King ALL STARS, KEMURI, KEN YOKOYAMA, Dohatsuten, NAMBA69, PUFFY, BEGIN, Flower Companyz, POLYSICS, MIGHTY CROWN, RYUKYUDISKO and RIP SLYME. Sunday’s performers are MONGOL800, EGO-WRAPPIN’ AND THE GOSSIP OF JAXX, Kazumasa Oda, kariyushi 58, THE COLLECTORS, Sambomaster, STARDUST REVUE, Tokyo Ska Paradise Orchestra, Dragon Ash, Hanaregumi, BRAHMAN, MAXIMUM THE HORMONE and RHYMESTER.